Well, if you have read the title of this post, you probably have guessed that I wasn’t a huge fan of this book. 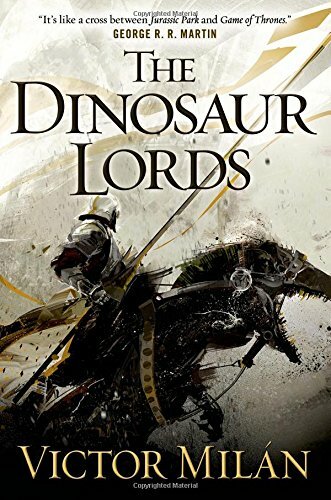 First off, the title The Dinosaur Lords. The thing that I loved the most about it was the ‘Dinosaur’ and really, the book lacked a lot of those. I mean, yeah, there was dinosaurs, but they were much more seen as big expensive horses than huge ferioucious beasts. One of the character, Rob Korrigan is a dinosaur master (as well as a bard and a Traveler ) and he is supposed to be fascinated by them but except the fact that he repeatedly tells us that he loves them, we don’t know why and what is so special about them for him. This is like I said that I was passionate by music and then, I never mentionned it. Why ? Anyway, now would be the time to do a quick synopsis. This story is set in a world called by Paradise, created by the eight Creators who brought the Humans and their Five Friends which are dogs, cats, ferrets, goats and horses. Yeah no dinosaurs, we don’t know why they’re here or why. That begins well doesn’t it ? The book follows a cast of five characters which composed two separate storylines. On one side we have Rob Korrigan, a dinosaur master but also a very talented bard and Traveler ( a guy who travels a lot and tells story about the world, which is pretty much the same thing as a normal bard yes, but Milan wanted to create another job for Rob) and Karyl, a former mercenary who is supposed to have died twice (no less). Those two are engaged by the Council of Providence, a place where everyone is supposed to be equal, to build an army to defend it against invaders. The second storyline is set in the court of Nuevaropa where we have the pleasure to meet three other characters. Count Jaume, the most handsome, loyal and talented noble in Paradise, Melodia, the Emperor’s daughter, the most beautiful and ‘smart’ woman in court and finally Duke Falk, a former enemy of the Empire. Now that we have the names of all those lovely characters, I could probably try to tell you what they do and why they are important but since they start to do important stuff after the first half of the book, that would be spoiling and I wouldn’t want to do that. So since I can’t really talk about the plot, let’s discuss about the characters, the worldbuilding, the writing style and finally what bothered me the most in this. Let’s start with the characters. As I said before, we follow a cast of five characters and I was interested in only one, Duke Falk because he wasn’t as one dimensional as the other ones. I found that there wasn’t really character development in this book and that they did not adapt their reactions to the situation they were put in. Indeed they were all put in a “role” at the beginning of the novel and stuck in it for almost 500 pages and that’s not really pleasant to read. For example, you could basically define each character in a word or two. Jaume was loyal and grand in an extreme way that turn him into a boring puppet during the second part of the novel, Melodia was so sure of her uselessness that she turned in what she thinks she was, Karyl was the talented strategist that don’t want to be followed anymore, Rob was a sexist idiot and Duke Falk was a manipulated brute (but at least he has some reason to be). This book was compared to A Song of Ice and Fire by George R.R. Martin himself but I just can’t seem to see a ressemblance between both works., because as much as Martin’s work is deeply layered and complex with fascinating characters that don’t stop to surprise us, this was not. This brings us to my next point, the worldbuilding. Or would it be better to call it, the info-dumping ? Probably. As much as the prologue of the book was interesting and intriguing, the rest was a disappointment. First of all, the book almost immediatly opened on a huge battle with dinosaurs which may have been awesome if we weren’t as confused with “who is who, why are they fighting and please someone explain to me what is happening ?!”. Indeed, the whole book was supposed to be both full of political intrigues and dinosaurs (which is basically the only I want to read about thank you very much), however one of the big problem is that the different political rivals weren’t introduced progressively in the story but all at once in a big paragraph filled with information on Paradise that completely lost me. Even at the end of the novel I didn’t completely knew who was who. The only thing that was completely clear was that they all wanted the throne and that they hated the Emperor but that was pretty much it. Also, another thing that bothered me in the worldbuilding was how the mythology of the world was introduced. Paradise was created by a whole crew of gods named originally the Creators that protect the world with the Grey Angels. They brought the humans to the world with their Five Friends and the Book of True Names which is a book that describes all of the dinosaurs species.and that’s all we know. We don’t know the reasons of this or why it happened because…the book doesn’t tell. Also people can do magic, but you don’t know how or why just certain people, the book doesn’t explain anything. And that’s frustating as hell. Finally, this book bothered me in other ways but especially in the way women are represented. There is a thing that I just can’t stand in books and it is sexism. I know that this is not something rare especially in older fantasy books but it still doesn’t make it alright especially in 2015 to read horrendous things about women. First of, Melodia and Jaume are in a relationship during the majority of the book and Melodia is litteraly obsessed with Jaume, it’s awful. He seems to be the only thing interesting in her life even if she is the Emperor’s daughter and she almost seems to live through him eventhough he almost never take her advices about the conflict seriously because she’s a woman and what does she knows about war uh ? I wanted to say other things but even though I finished this book two days ago, I am still so mad that I think I am going to stop here. Would I recommend this to you ? Nop. Never. Please go read something else. Will I continue on with this series ? 1/5 It wasn’t even well written. The only good thing was the cover. 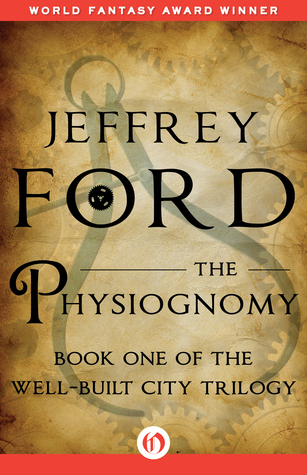 The Physiognomy by Jeffrey Ford is the first installment in the Well-Built City Trilogy. It actually won the World Fantasy Award back in the days (in 1997 if I am not mistaken so the year I was born so that’s weird). Ford creates a world ruled by the Master who controls the country (which is nameless) from the Well-Built City thanks to his physiognomists, who are basically a mix of scientists, lawyers and police officers, that can read other persons because of their physical features, read their past but also predicts their future. For example if you are predisposed to stealing, you will have a diffrent appearence that if you predisposed for a career as a minister. The story mainly focuses on Cley, a physiognomist sent as a punishment on a mission in Anamasobia, a mine far away from the Well-Built City where he has to find the stolen White Fruit of Paradise that will grant the Master immortality so that he will be able to rule the Well Built City forever. Obviously nothing is going to happen as planned and Cley will make a discovery that will shatter everything he believe in. This book was a weird one. It has interesting view on certain subjects such as propaganda, dictatorship and religion while being filled with dark humor and cynism. I usually like those in books but I would have appreciated the book a lot more if it wasn’t as weird… The first third of the book I really liked, the world was interesting, the character of Cley wasn’t likeable but at least he was intriguing to read about. However somewhere around 40% of it the story became a lot more bizarre. It has lots of passages where you didn’t know if it was supposed to be illusions or if it was happening for real. This was due to the fact that Cley is literally often on drugs and while he’s on it he has illusions and if he has to take it, he has hallucinations or really strange dreams so, it may lost you. At first, I didn’t mind too much but after a certain point, the book lost his interest and I was kind of forcing myself to get through it… Also the pacing of the story was a bit odd at parts (especially at the ending) and I really dislike it. As I said before, this book has some interesting point. For example at one moment, Cley ask the Master why he hasn’t forbid religions since on a scientific point of view, he finds them useless. At this moment the Master answers that yes, they might not be relevant in a scientific way but that they are a great way to manipulate people and while people are thinking about their religion, they are not planning rebellions. I actually find this statement pretty true and thought-provoking. I feel like in those moments it was a type of dystopia that was unique to read about. Will I continue on with the trilogy ? No. The ending was alright but I don’t particularly care for what is going to happen. I feel like this could be read as a standalone since the ending is not cliffhanger. I know I am five days late but oh well, here are my plans for the month of September ! I also have to read The Physiognomy by Jeffrey Ford that I received from Netgalley in exchange for an honest review. I don’t know to much about it except that it won the World Fantasy Award in 1997 so it should be interesting. I would also like to get to The Traitor Baru Cormorant by Seth Dickinson and Twelve Kings by Bradley Beaulieu because I have heard great things about both of those books. I really can’t wait to read and review them here ! Finally, I plan to read The Dinosaur Lords by Victor Milan. When I first heard about it and that I saw the wonderful cover by Richard Anderson I almost had an heart attack and how could I not ? I mean look at this beauty ! It has a blurb from George R.R. Martin saying that it is a mix of Game of Thrones and Jurassic Park and if that doesn’t sold this book to you I don’t know what I can do for you… Anyway I was really excited for it but since its release I have heard really bad things about it so I have lowered my expectations quite a bit. Hopefully it is not too bad but we shall see, I will definitely post my thoughts on it here anyway ! Since I have started university I don’t know if I will be able to read other things so I won’t add other books.